Bella Vita Decorative Trimmings, a new generation of trim for drapery, curtains, pillows and more. Bella Vita offers beautiful styles and colorways to coordinate with today's newest fabrics. Bella Vita is available in three distinct collections: Perle, Modele and Estilo. The Perle collection is available in nine trim styles including brush fringe, jacquard tapes, braids, cording, micro ribbon cord, tassel and beaded fringe with recycled glass beads. Twelve colorways available in each style. Modele is offered in ten unique trim styles. Each style is available in ten colorway. The Estilo collection was designed to meet basic design needs at a good price point. Seven styles, eighteen colorways available for your project. Wooden Curtain Rod Poles can be used with pinch pleat draperies, tab top, tie top and grommet curtains. All components needed to dress your window to your exacting specifications available as options. Each manufacturer offers a selection of size ranges in width and diameter. Widths are available from three feet to sixteen feet and diameters from five-eights inches to three inches. Most are available for quick two to three day shipping from reliable distributors that are not afraid to stock what they sell. Components are made of selected wood, resin and metal. Components are color coordinated within each product line. Architrac systems are used in homes, hospitals, hotels and other commercial building where demanding performance is desired. Sizes range from 12 feet to 20 feet and can be joined to achieve even wider widths. All styles except the 94008 are made of sturdy aluminum that can support up to 80 pounds. Many styles can be cut to size for shipping and convience. Custom assembled tracks are available in standard, curved and bend configurations. These can solve installations on regular windows, corner windows and bay or bow windows. Select your size from the list below. Listed from smallest to longest, grouped by the type opening desired, center, one way right or one way left. Double traverse rod sets are also available ready to install. 2 inch fluted wood pole, Wood Trends Renaissance collection. Wood drapery rods. 6 feet wide, by Kirsch. Use as swag drapery pole. Wood drapery rods by Kirsch. For warm drapery rods look, solid wood construction. Kirsch's reputation for quality and elegance was built on Wood Trends. Offered with a wide assortment of optional components such as elbow brackets, swivel sockets and holdbacks. Wood Trends is a functional solution for many windows. Note: Some colors are more, unfinished is less than amount below. 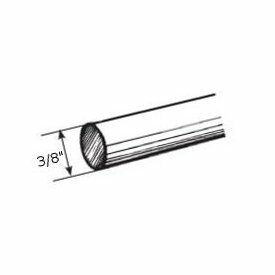 Kirsch wood trend 3 inch diameter smooth wood pole. Wood drapery rods. Extra long curtain rod poles by Kirsch. Note: Some colors are more, unfinished is less than amount below. Modern Metal Elm - Smoke Glass finial and cuff for one inch rods. Width is 1 1/8" and diameter is 2". Cuff is 3/4" wide by 1 1/4" diameter and covers 5/8" of the rod ends. Paris Texas Hardware Quick Ship program. Finial only, pole shown not included in price. Modern Metal Ella finial with cuff for one inch rods. Width is 1 1/2" and diameter is 1 5/8". Cuff is 3/4" wide by 1 1/4" diameter and covers 5/8" of the rod. Paris Texas Hardware Quick Ship program. Modern Metal Knox - Crystal finial with cuff for one inch rods. Width is 1 1/4" and diameter is 2 1/4". Cuff is 3/4" wide by 1 1/4" diameter and covers 5/8" of the rod. Paris Texas Hardware Quick Ship program. Modern Metal Nora - Mercury Glass finial with cuff for one inch rods. Width is 2" and diameter is 2 1/4". Cuff is 3/4" wide by 1 1/4" diameter and covers 5/8" of the rod. Paris Texas Hardware Quick Ship program.